Esker solution integration capabilities allow you to automate your O2C and P2P processes directly in your MS Dynamics™ NAV ERP, resulting in greater process efficiency and productivity across every phase of business operations. Esker’s Accounts Payable automation solution provides a single solution for document processing — directly into and out of MS Dynamics NAV — to automate, streamline and simplify AP processes, including invoice verification, approval and mobile support. 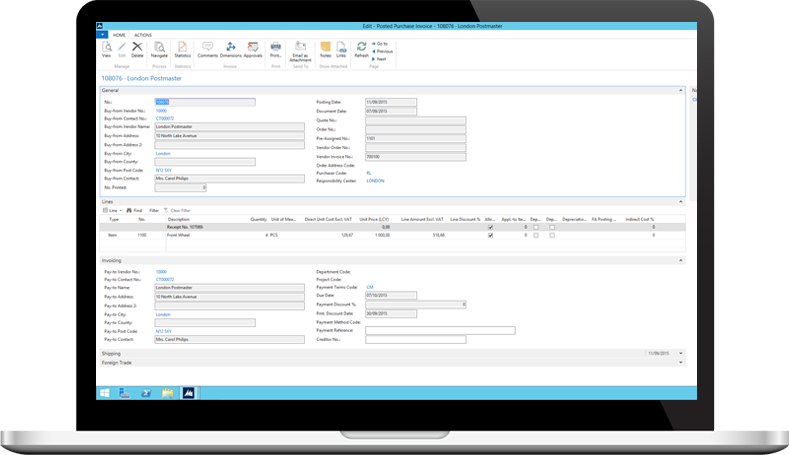 Available for MS Dynamics NAV 2017 Financial Application, as well as for the two previous versions of the ERP application, Esker enables companies using NAV financial applications to remove the burden created by paper-based invoice processing. Receive and track AP invoices in any MS Dynamics NAV environment. Esker’s innovative workflow technology integrates directly with MS Dynamics NAV to streamline the reception, handling and approval of invoices, while providing a full audit trail from invoice receipt to payment posting. Captured data is checked against MS Dynamics NAV master data and dispatched to the appropriate parties for approval. Invoices are automatically archived in a web portal and linked back into MS Dynamics NAV, where they are available for as long as needed. Automatic supplier and invoice data synchronization helps leverage MS Dynamics NAV data to support full AP process automation. AP workflow outside MS Dynamics NAV delivers better business continuity, 24/7 access, non-MS Dynamics NAV user approval capability, easier training and greater user acceptance. Invoice archive link in MS Dynamics NAV enables users to conveniently access the original invoice image and processing data directly from the ERP invoice record. Invoice posting error management so that if an error occurs when the invoice is pushed to MS Dynamics NAV, the information is made available to the user in Esker's solution. Quick solution setup — communication between Esker’s Accounts Payable solution and MS Dynamics NAV is fully operational in just a few days. As a Microsoft Gold-Certified Partner, Esker collaborates and promotes its expertise and relationship with Microsoft to its customers. Microsoft Partners have in-depth access to a variety of exclusive resources and early product information, which help them develop the expertise customers demand in today’s competitive market. The integration capabilities of Esker’s solutions are built on proven Microsoft technology, providing customers with a reliable ERP integration and offering IT departments the peace of mind they require during rollouts of new technologies. today to learn how to maximize your MS Dynamics NAV investment.